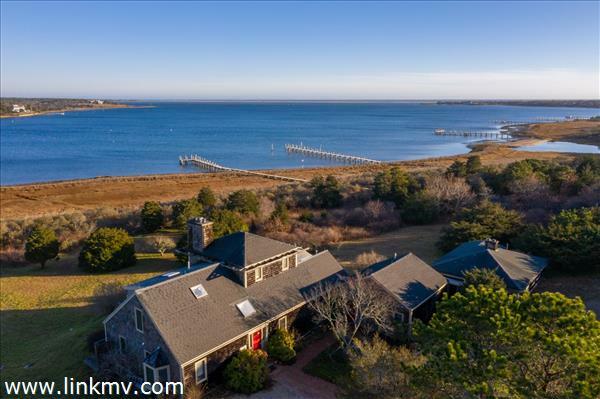 This extraordinary waterfront house and guest house sits majestically on the shores of Katama Bay and features a dramatic 180-degree waterview across Katama Bay to Norton Point and as far as the eye can see. The 4 bedroom home is immaculately maintained and features an open kitchen, living room with dramatic waterviews and three guest bedrooms on the first floor. The second floor includes a master bedroom suite overlooking Katama Bay. A separate and charming 661 +/- square foot guest house with a full kitchen completes this stunning compound. A manicured footpath and boardwalk lead you through tall beach grasses to a private dock on the water's edge. This is the summer retreat you have been looking for! Open kitchen and living room with a fireplace, master bedroom, and 3 guest bedroom. Second-floor master suite with sweeping water views. Permitting is in place to expand the current dock to deep water dock and is awaiting final approval. Potential to tie into both town sewer/water. Copyright © Alisan Lohan-Conway Properties. All rights reserved.